The parents of little Phoebe, who suffers from a condition called Plagiocephaly, a variant of flat head syndrome, have spoken out about their experiences to help to raise awareness of treatment available for the condition in the UK. Mum Jessica and dad Nicholas, from Marlow in Buckinghamshire, are keen to highlight the condition and the lack of available treatment on the NHS. When Phoebe was just three-months-old, mum Jessica started to realise something was wrong as she was always sleeping on her one side. Jessica, 32, recalls: “She always had a tendency to lie on her one side and soon the visible signs that something wasn’t quite right were very obvious. We were eventually told by our GP that some of the muscles on one side of her neck were shortened, causing restrictions on the movement of her head. “The flattening of the head had pushed everything forward on one side of her face, and that was upsetting to see. That was when I knew I had to do something. I decided to turn to the Internet for advice. It was a fantastic resource and I realised that I wasn’t going through this alone. The clinic provides a treatment, which isn’t currently funded by the NHS, called TiMBand – a helmet that is fitted to the baby’s head and remoulds the head to the shape it should be. Phoebe had to wear it for 23 hours a day from the age of four months until 10 ½ months but the results spoke for themselves. Jessica added: “I was a bit worried at first and the first night we tried it out was difficult, but she accepted it very well and it just became part of the routine. She really took to it. I think she even misses it now. Sally Hews, a leading expert in the treatment of Plagiocephaly at the clinic, explained how the treatment works: “Cranial remoulding treatment works by channelling further growth in the flatter areas of the skull to form a more symmetrical head shape. The treatment usually lasts between three and six months. 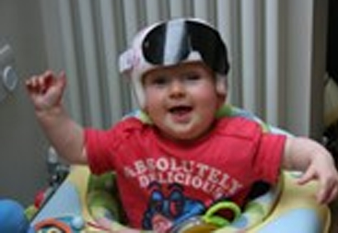 Phoebe responded well to the treatment and made excellent progress during the six months that she wore the helmet”.